Though I'm older and (a little bit) wiser now, I'm still fascinated with all kinds of fortune-related things: astrology, tarot cards, fortune cookies, and even psychics (I've yet to visit one, but every time I drive by a sign, I feel a little tug of curiosity...). As much as I'm fascinated by these things, I've also spent most of my life flip-flopping on the validity of them. In my heart, I want to believe horoscopes are written by people who understand deep meanings held in the stars, but my logical brain reminds me that horoscopes are written every day around the world and certainly not all of these people could have some sort of deep understanding of how balls of fire in the sky relate to human lives. And, yet, even with all of the knowledge in the world, I can't quite turn away from horoscopes. I can see both sides: the logic and the heart, a tell-tale trait of my Leo/Virgo cusp star sign, haha! (I wrote this line as a joke, but then when I found a link to explain it, I was once again blown away with how accurate it is, which, I suppose, brings me to my point...) I believe individual, daily horoscopes are fictional, but I'm not entirely sure that astrology as a whole is completely made up (here's an article with arguments as to why it should be taken seriously). Every time I read my horoscope, I’m torn between the between facts (I know it’s been written by a normal human just like me, even if that person does know more about astrology than I do) and feelings (there’s just something so satisfying about reading something that makes you feel understood or provides guidance seemingly tailored for you!). I’ve never really known what do about this “facts vs. feelings” inner dialogue so I’ve mostly ignored it, reading my horoscope when I wanted to, taking from it what I needed, and shushing the part of my brain that piped up, “But this is just nonsense some random person wrote!” All this changed a couple weeks ago when, in the midst of a little self-love reflection, I had one of those a-ha! moments. I finally understood why I love horoscopes and fortunes so much — and why it actually doesn’t matter that they’re not factual. The reason many of us love horoscopes — regardless of whether or not we believe in them — isn’t because of the specific guidance or insight they provide. It’s because, no matter what is written, we take away from it what we need. Horoscopes provide insights not because they’re so insightful, but because they prompt us to think about how the words — whatever they might be — apply to our lives. So, here's my thinking. We should read horoscopes, even if it's just for the opportunity to do a tiny bit of soul-searching. If you already read your horoscope, use tarot cards, see a psychic, etc., keep at it — but strive to be mindful of your responses what you read, see, and hear. (Remember: your responses tell you much more than the words or images ever could!) Rather than simply taking the words and moving on with your day, sit with them for a minute and ask yourself why you agree or disagree with what’s in front of you. Doing that is where the value is — not in the content itself. And if you don’t read your horoscope because you think it’s made up (it is), you think tarot cards are for witches and hippies (stop judging! ), or you believe psychics are just scammers (perhaps...), consider giving it a try and see how you feel. Remember the value is not about what’s in front of you; it’s about how you react to it. As Shakespeare once wrote, "It is not in the stars to hold our destiny but in ourselves." We control our destinies, but we can actually learn more about what we want that destiny to be by looking at messages from the stars. Most of us spend a great deal of time online, in our in-boxes, and on apps. While I'm a huge fan of technology and the connectivity that comes with it (after all, I wouldn't be able to do what I do for a living if it weren't for the amazing power of blogging and social media! ), sometimes it takes away from being positive and present. And, quite frequently, it takes away from the concept of self-love, my primary for focus for 2017 (and probably the rest of my life as well!). I've read countless articles about taking a social media break or limiting it to a certain amount of hours each day, but I believe those ideas are just putting a bandaid on the problem. If you need constant breaks from something or have to limit it because it's unhealthy for you, it's important to look at why you need to break/limit yourself. What is it that you feel when you're online or on apps? Are those feelings positive or negative? Do you want to keep feeling them? As I move through this year of self-love, I'm striving to get more in touch with how things make me feel. I tend to be very logic-oriented, and sometimes I forget that feelings are just as important as logic (even if they're not always as easy to identify!). When you have awareness of the feelings that come with certain experiences, people, things, etc., you can then make choices that help you to create a more positive, mindful, and self-loving life. Awareness is the first step toward change. This year, I'm striving to create more of that kind of awareness in my life (and make changes accordingly), and this week I'm turning my attention to social media, apps, and the places I spend time online. Specifically, I'm turning my attention to getting rid of those that don't create feelings of love, positivity, and inspiration. What we surround ourselves with -- both in real life and online -- has a great impact on how we feel and live every single day. It's all too easy to fall into patterns, to do something you've always done simply because you've always done it, but I think it's a big mistake to be passive when it come to online consumption. There are a great many things we cannot control in this life, but one that we can is what we look at on our computers or phones. 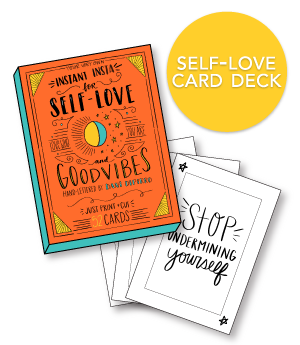 To create more self-love and positivity in our lives, we have to consume consciously (I know, that sounds like something Gwyneth Paltrow would say, but hear me out! ), especially what we consume visually and electronically. Because I've come to realize how important this is, I came up with the idea of Inspired Unfollowing, a week of reflecting on what I've been consuming online so I can actively choose whether I want to continue doing so. I hope you'll join me this week in taking control of what you consume. It all comes down to how something or someone makes you feel. The more you surround yourself with sites, apps, people, and accounts that uplift and inspire and inform, the more uplifted and inspired and informed you'll feel. And we only have so many hours in a day to look at social media, and there's soooo much out there, so it's up to you to choose consciously what you want to see. IMPORTANT DISCLAIMER: Surrounding yourself with positive, inspiring social media does not mean avoiding things that might evoke negative emotions (i.e., upsetting but important news stories) or people whose beliefs differ from yours. One of the worst things any of us could do at a time like this would be to avoid people who are different from us. In fact, I encourage you to find some accounts and websites that don't hold your views and visit them periodically to open your mind to a new perspective. The world isn't all sunshine and rainbows, nor is it filled with people who believe exactly what you do, and avoiding all negativity is not good practice. There's a big difference between things that add value -- such as news, even if it's not positive news, or people who share opposing views, but who do so in a kind, thoughtful way -- and things that make you feel terrible without providing useful information. Okay, now that that disclaimer is out of the way, let's jump into the plan for the week! First up, our in-boxes! How many emails do you get each day? How many of those are email subscriptions you signed up for but no longer want? (Or were signed up for but never wanted in the first place?) Even if you don't end up reading these emails, you have to spend time and energy deleting them each day. Set aside time today to go through your email and unsubscribe from those emails you no longer want to receive. If you don't want to do it manually, there's an awesome site call Unroll.Me that'll do it for you! Facebook can be a tricky one because, for a lot of us, we're follow (aka, "friend") people we know. We might worry that it would be offensive to unfriend someone on Facebook (even if that person is just an acquaintance). The great thing about Facebook is that you can unfollow someone without unfriending him/her. (Read this article for specifics.) You can (and should!) choose what you see on Facebook without causing offense to friends, family, or acquaintances. Instagram is often more of a mix of family/friends and brands/celebrities. Unlike Facebook, you can't unfollow someone politely without unfriending him/her, but that doesn't mean you shouldn't curate an Instagram feed that brings more positivity and self-love into your life. While sorting through your "following" list, ask yourself, "Does this person / brand make me feel less worthy, unhappy, or negative when I see their posts?" If the answer is yes, click that "Following" button so you no longer see those posts. Twitter is my go-to spot for staying up on the latest news. If you want to know what's happening right now, Twitter is the place to go. But, over the past few months, I've realized that it drains me and drags my emotional state down -- and that has a lot to do with the people I follow. I love comedy and follow a lot of comedians, but, unfortunately, a lot of comedy can be negative. This week I'm clearing out the negativity! Pinterest is one of my favorite online spots and, for the most part, I love the people I follow and feel inspired and uplifted when I spend time on Pinterest. But, I've been on Pinterest for a long time and there are some people I followed years ago that are no longer adding value to my life. They might not be especially negative, but they're not inspiring either. Because there's so much wonderful content out there, you've got to make room for the great by getting rid of the "eh." What websites or apps do you open on a daily basis? And, more importantly, why do you open them? Sometimes we have great reasons for opening these, but often we do it just because we've always done it. It's habit; not choice. Over time, I've cut down on certain websites I visit (especially brands that made me long for items I hadn't even known existed before I'd opened the sites or YouTubers who made me feel I needed the latest lipstick shade), but I'm now also cutting down on the apps I keep on my phone as well. Remember: just because you have a Twitter / Facebook / etc. account, doesn't mean you need instant access to it at all times. Taking an app off your phone can be a great way to be more conscious about your content consumption. It's often much more difficult to log-in to an account on your phone or to go to your computer than it is to click an app open, making it more likely that you'll think before doing it, rather than just absentmindedly clicking while bored! I've already started on Inspired Unfollowing, a little bit at a time, but I'm excited to see how I feel at the end of this week! If you're going to join in on this, but you're a bit unsure about unfollowing certain accounts, I recommend writing them down somewhere and then unfollowing. If you keep thinking about them or miss them, you can always go back to your list and re-follow. (But, believe me, I bet if there's any doubt in your mind whether or not you should be following an account, you probably don't really need it in your life.) As a bonus, you can take note of the accounts you're consciously choosing to follow and seek out more accounts like those! We have a certain amount of time for social media, and that time should be filled with consciously chosen content! Did anyone else have an existential crisis, freak-the-hell-out meltdown last week or was it just me? It was sure a rough week for me, personally and professionally, and, though I wanted to curl up on the couch and escape the world with a book (really loving The Animators right now! ), I knew this was a perfect time to put the words I write each week into practice. I knew I had the tools to figure out a way to make the most of things, even though I was feeling pretty helpless, so decided to give them a shot. Here's what I did to cope this week. Hopefully these tips will help you if you're feeling meltdown-y, too. Like most adults, I'm not a big crier. Crying is generally reserved for heartbreak or loss (or seeing roadkill on the side of the road -- if there's any sort of animal death/pain, I will cry), but this week I had a good ol' cry. I'm talking about the shoulder-shaking, sobbing-like-your-pet-just-died kind of cry, the snotty, ugly cry that necessitates more than one nose-blowing after you're done. It wasn't pretty, but it actually felt good. Most of the problems I'm currently facing aren't new; I've just been avoiding them for so long that it felt good to acknowledge to myself (in the form of tears) that things aren't going well. It's unpleasant, but acknowledgment is the first a step on the path to making things better. I'm certainly not going to cry every time something goes wrong, but this week I really took note of how good to feels to physically feel your pain and release it in a way that, even though it hurts, ultimately feels good. After I allowed myself that cry (and, yes, it was an allowance -- so many times I want to cry, but I don't because it tell myself it's a waste of time or insist to myself that I should strong), I decided to open up a bit and talk it out. Usually when things aren't going well -- especially professionally -- I tend not to talk about it with anyone else. One of the downsides of running your own business is that it's somewhat an extension of you in a way that doesn't happen with other jobs. If my business is failing, it feels like I'm failing as a person. I'm sure others feel this way about their work, too, but there's something about running the show (and being the sole performer in the show!) that makes the professional deeply personal. So I generally keep it to myself when there's trouble, and do my best to find a way to work it out. But this week I decided to open up a bit more, sharing my struggles with friends (and now with you, in a way!). None of the talking resulted in immediate solutions or major a-ha moments, but it felt good to open up, to get feedback, and to not keep everything in my own head. Okay, this one might be a personal preference, but when I'm feeling low, one of my go-to moves is to put on a great, upbeat song and have a little dance party by myself in my apartment. (Putting that in writing, I'm now wondering if that's an odd thing to do, but I'm pretty sure I can't be the only one who does that, right? Also, by "dancing," I mean "awkward flailing that usually scares my pup, ha!) If you don't like dancing or listening to uplifting music, I bet there's something that instantly puts you in a positive mood, no matter how low you're feeling. Post-cry-session, I decided I was going to flip the mood by turning on the songs I'm loving and getting moving. (Exercising probably does the same thing, getting those endorphins going!) Of course, this doesn't solve any of my problems, but it certainly improves my mood, putting me in a more level-headed state where I can make more positive decisions. I decided to make a little playlist for you, if you're feeling like you need to dance it out. 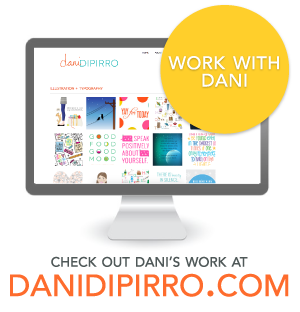 Find Dani's Dance Party here on YouTube. Laughter, for me, really is the best medicine. Watching something hilarious has always been one my best strategies for coping with pain, and this week it served me really well. I spent a lot of time seeking out things that made me laugh -- silly YouTube videos, comedy specials on Netflix, funny friends. Like dancing, laughing doesn't really fix anything, but it does shift your mindset from pain to pleasure, and in that more positive state, I feel like my thinking is clearer. Apparently, laughter decreases stress hormones, increases immune cells and triggers the release of endorphins, which promote an overall sense of well-being and even temporarily relieve pain. So, even though laughing might seem frivolous, it has some major physical and psychological benefits, all of which can help a great deal when it comes to having a mental meltdown. Once I got through some of the emotional stages of my meltdown, it was time to get to work. If things aren't going well and they're within your control (unlike, say, the loss of a loved one -- though any sort of emotional reaction to that is more about the pain of loss than it is about meltdown), it's up to you to take action to make things better. Having a meltdown is cathartic and all, but if you don't use that emotional freakout as a catalyst for change, it won't be long before you find yourself again in Meltdown Town. So I got out my laptop and I got to work on planning how I'm going to fix the multiple messes I've found myself in. These aren't the kinds of things that'll be fixed over night, but they'll never be fixed if I don't start trying to repair them. It felt good to admit to the problems, to feel them, and to start taking positive steps to rectifying them. There's still pain and I know it goes deep because I'm currently shaking off a horrific nightmare that was so obviously, perfectly symbolic that I woke both scared of and impressed by my own mind. But I'm ready to make progress now. And, really, isn't that what a meltdown is for, to shake us up, to get us to pay attention to what's not working so we can transform it to something that is? As I was finalizing this post, I heard Shonda Rhimes' voice coming from my TV screen. She said, "The idea that there's suddenly no plan is breathtaking in its terror." That sentence so adequately describes how I'm feeling right now. It's a terrifying place to be, but terror is freeing in a way. When nothing is determined, anything can happen. It's tempting, when plan-less, to imagine the worst, but if anything can happen, then that means amazing things can happen, too.